Matt Rhodes, the lead concept artist on Dragon Age: Inquisition has recently become obsessed with the Dune franchise, thanks to the amazing Jodorowsky’s Dune documentary (which I can't recommend highly enough for sci-fi fans.) 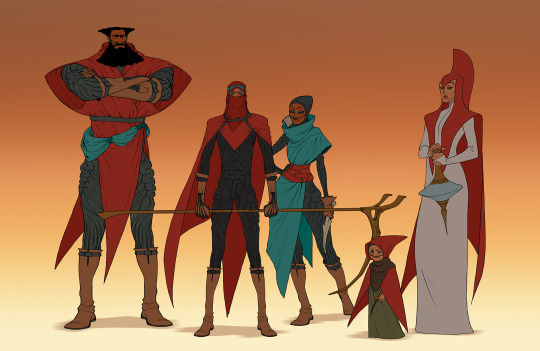 The result is some great concept art, inspired by Indian filmmaker Tarsem Singh, that makes us really wish that the folks behind MTV's Æon Flux series would create an animated series based on Dune. Check out the pieces below. There are only three of them, but they're enough to set your imagination on fire! "I finally gave in to the siren song of Dune and was dashed upon the rocks like so many concept artists before me. There just isn't time to render these, but I’m reasonably pleased with the linework, so here they are! So, in order to get that thought out of my brain, I took a clumsy swing at designing the cast of Dune through the lens of Tarsem Singh’s crew. To me, that meant making each character an operatic or theatrical expression of their role in the story. Visual storytelling cranked to eleven."